Let's get started with OAuth Roles! The resource owner is the user who authorizes an application to access their account. The application's access to the user's account is limited to the "scope" of the authorization granted (e.g. read or write access). 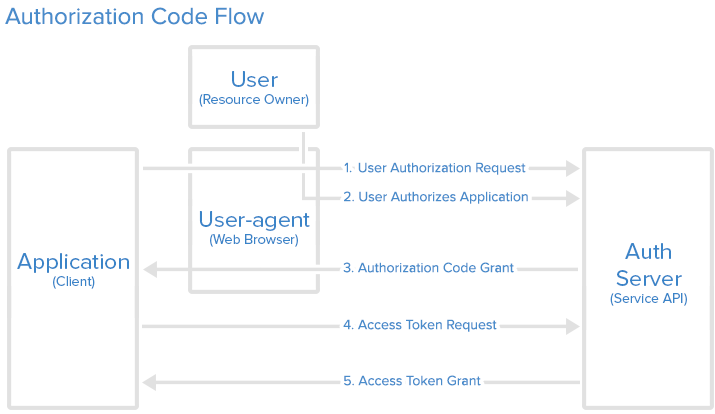 From an application developer's point of view, a service's API fulfills both the resource and authorization server roles. We will refer to both of these roles combined, as the Service or API role. The client is the application that wants to access the user's account. Before it may do so, it must be authorized by the user, and the authorization must be validated by the API. Once your application is registered, the service will issue "client credentials" in the form of a client identifier and a client secret. The Client ID is a publicly exposed string that is used by the service API to identify the application, and is also used to build authorization URLs that are presented to users. The Client Secret is used to authenticate the identity of the application to the service API when the application requests to access a user's account, and must be kept private between the application and the API. The authorization code grant type is the most commonly used because it is optimized for server-side applications, where source code is not publicly exposed, and Client Secret confidentiality can be maintained. This is a redirection-based flow, which means that the application must be capable of interacting with the user-agent (i.e. the user's web browser) and receiving API authorization codes that are routed through the user-agent. This particular screenshot is of DigitalOcean's authorization screen, and we can see that "Thedropletbook App" is requesting authorization for "read" access to the account of "manicas@digitalocean.com". Now the application is authorized! It may use the token to access the user's account via the service API, limited to the scope of access, until the token expires or is revoked. If a refresh token was issued, it may be used to request new access tokens if the original token has expired. The implicit grant type is used for mobile apps and web applications (i.e. applications that run in a web browser), where the client secret confidentiality is not guaranteed. 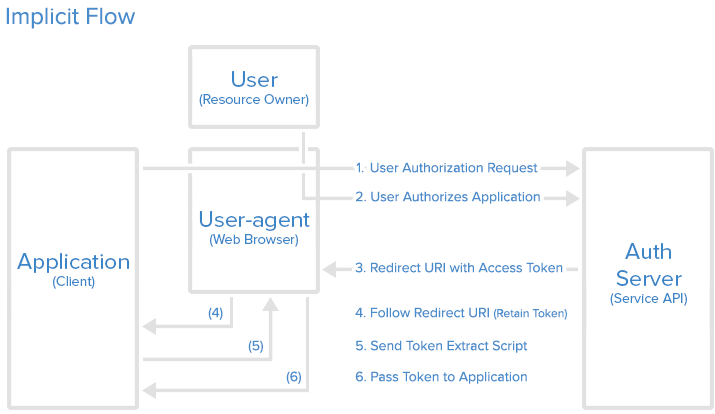 The implicit grant type is also a redirection-based flow but the access token is given to the user-agent to forward to the application, so it may be exposed to the user and other applications on the user's device. Also, this flow does not authenticate the identity of the application, and relies on the redirect URI (that was registered with the service) to serve this purpose. We can see that "Thedropletbook App" is requesting authorization for "read" access to the account of "manicas@digitalocean.com". Now the application is authorized! It may use the token to access the user's account via the service API, limited to the scope of access, until the token expires or is revoked. With the resource owner password credentials grant type, the user provides their service credentials (username and password) directly to the application, which uses the credentials to obtain an access token from the service. This grant type should only be enabled on the authorization server if other flows are not viable. Also, it should only be used if the application is trusted by the user (e.g. it is owned by the service, or the user's desktop OS). Note: DigitalOcean does not currently support the password credentials grant type, so the link points to an imaginary authorization server at "oauth.example.com". Note: DigitalOcean does not currently support the client credentials grant type, so the link points to an imaginary authorization server at "oauth.example.com". Once the application has an access token, it may use the token to access the user's account via the API, limited to the scope of access, until the token expires or is revoked. 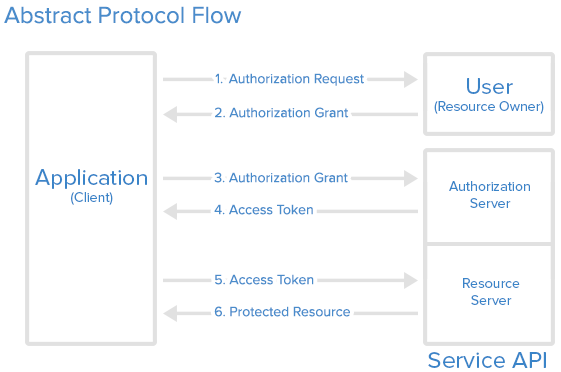 Assuming the access token is valid, the API will process the request according to its API specifications. If the access token is expired or otherwise invalid, the API will return an "invalid_request" error. After an access token expires, using it to make a request from the API will result in an "Invalid Token Error". At this point, if a refresh token was included when the original access token was issued, it can be used to request a fresh access token from the authorization server.